Abstract How does precarious, low-status/low-wage jobs affect the participation and representation of migrants in community associations, collective organizations and trade unions? Has the recession increased their interest in membership in collective networks of solidarity and organized labor claims? What perceptions and practices have migrants developed towards community, labor and workplace solidarity and collective forms of organization and protection? In Greece, immigrants and refugees have become part of a cheap workforce reserve that is continually renewed while the division of labor prompts and entraps migrants into wage labor and low-status/low-wage jobs, distinguishing them by class, gender, race-nationality (Psimmenos 2011). The jobs in which migrants are largely employed are paid or not paid occupations outside the margins of formal employment and unregistered. They are considered non-attractive, without social prestige and inferior by the workforce of the reception society, however they do provide economic profits and social status attainment to the customer or employer (Portes, Castells and Benton, 1989, Parreñas, 2000; Anderson, 2000). The labor that migrants are exposed to is not only characterized by precarity, low-status and low-wages, exploitation, flexibility and instability, isolation and individualization, but also by decollectivization (Fouskas, 2014, 2016), or in other words by alienation from familial, community, collective, networks of solidarity and labor rights. Precarious work is employment that lacks all the standard forms of labor security (Vosko, 2006) and creates enormous and complex barriers to labor organization strategies due to the isolated, atomized and non-unionized nature of immigrant employment (Choudry and Thomas, 2012). Greece comes first among the 21 OECD country-members where 24% of Greek GDP is formed by the underground/shadow economy (Williams and Schneider, 2013). Moreover, the percentage of uninsured workers is among the world’s highest (37.3%) and so is the percentage of irregular immigrants working (4.4%) (Williams and Schneider, 2013). This presentation focuses on the cases of Pakistanis Ethiopian and Filipino workers and how the frame of their work and employment in precarious, low-status/low-wage jobs affect their participation in secondary groups of solidarity and workers and their representation in them, i.e. 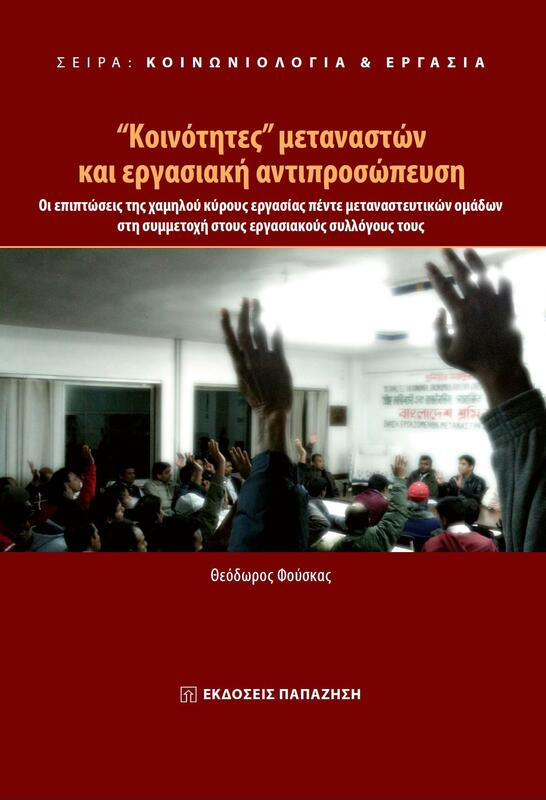 community, migrant labor associations and trade unions, during the economic crisis in Greece. According to the results of in-depth interviews migrants are entrapped in a frame of isolative and exploitative working conditions, i.e. street-vending, unskilled textile and manual labor, personal services and care and domestic work. In this working context, most of the interviewed migrants appear to have developed individualistic perceptions, they act in an atomistic manner, form materialistic beliefs, are indifferent to collectivity and solidarity and are isolated from their compatriots and other workers. They have low self-perceptions and expectations for social advancement and deal with their social and labour related problems individually, or completely resign from claiming them. Anderson, B. (2000). Doing the Dirty Work: The Global Politics of Domestic Labour. London: Zed Books. Fouskas, T. (2016) “They Do Not Represent Us! Repercussions of Precarious, Low-Status Work on Participation of Immigrants in Trade Unions in Greece”, in Jared A. Jaworski (Ed.) Advances in Sociology Research. Volume 18. New York: Nova Science Publishers, 75-126. Choudry, A. and Thomas, M. (2012) “Organizing Migrant and Immigrant Workers in Canada”, in Ross, S. and Savage, L. (ed.) Rethinking the Politics of Labour in Canada. Halifax: Fernwood, 180-181. Parreñas, R. S. (2000) “Migrant Filipina Domestic Workers and the International Division of Reproductive Labor”, Gender and Society, 14(4):560-581. Portes, A., Castells, M. and Benton, L. (eds.) (1989). The Informal Economy Studies in Advanced and Less Developing Countries. Baltimore: John Hopkins University Press. Psimmenos, I. (2011). “The Welfare Orientations of Immigrant Domestic Workers in Greece,” Greek Review of Social Research, 136(3):225-248. Schneider, F. and Williams, C. (2013). The Shadow Economy. London: Institute of Economic Affairs. Vosko, L. (2000). Temporary Work: The Gendered Rise of a Precarious Employment Relationship. Toronto: University of Toronto Press. Bio statement Dr. Theodoros Fouskas is a sociologist. He specializes in migration, migrant labour and migrant community organizations. Also in precarious, low-status/low-wage employment, integration of third country nationals, undeclared work, irregular migration, access of migrants to healthcare, labour solidarity, social protection, political participation and trade unions in the reception societies. He has taught at the Department of Professional Training of Police Officers-Executives at the Hellenic Police School of Further Education and Training (2011-2017, Greece), the Department of Social Work at the Technological Educational Institute of Athens (2016-2017, 2014-2015) and other academic institutions. 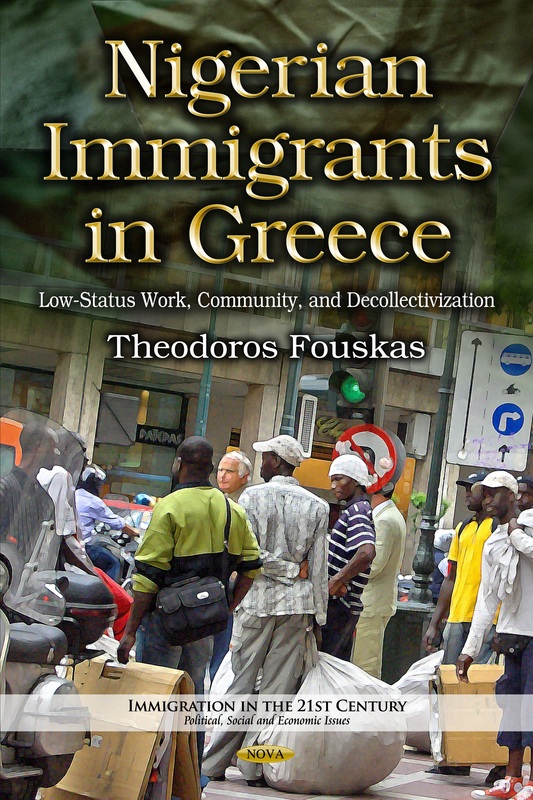 He has authored 2 monographs: Nigerian Immigrants in Greece: Low-Status Work, Community, and Decollectivization (Nova Science Publishers, 2014) and Migrant “Communities” and Labor Representation (Papazisi Publishers, 2012, in Greek) and he has co-edited the collective volume: Contemporary Immigration in Greece: A Sourcebook (with Vassileios Tsevrenis, European Public Law Organization Publications, 2014). Currently, he is preparing an edited collective volume entitled: Immigrants and Refugees in Times of Crisis (European Public Law Organization Publications, 2018). He has authored 7 chapters in collective volumes and published 10 articles in international and Greek peer reviewed scholarly journals and 14 research and policy reports. He has served as a reviewer for 7 journals and member of the editorial board in 1 of them. He has presented 62 papers at international and national conferences and workshops, and he has organized 9 scientific events. Since 2005, he has participated as project director and researcher in 15 European and national research programmes for migrants and other vulnerable groups. Principal contact for editorial correspondence.